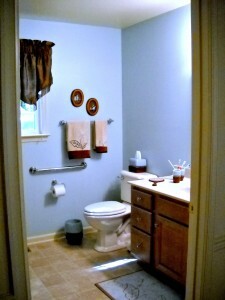 The addition of an universal design bathroom enable elderly mother to live with family. As our customer’s mother aged it was apparent the expenses of living in her retirement home would use up her life’s savings. The time for her to live with her son’s family was here. What kind of changes should be made? What would be needed? How best to mesh the active lives of a retired couple with the needs of an elderly parent and provide the Universal Design features to make her life easier. Our customer had some good ideas. It was determined that a master bathroom addition off of the existing dining room would do the trick. The dining room would become a sitting room for the new member to the household. The existing living room would be her bedroom. The new living quarters would be completed by a Universal Design Bathroom Addition. When mother is no longer in need of these living arrangements, the areas would easily convert back to living space for the main house. With the addition of a first floor master bathroom their home will be ready when this couple no longer desires to climb the stairs to their existing master bedroom. The owner’s choice of a Simonton Pro Finish double hung window with Colonial Sculptured grids, Low E and Argon gas provided just the right amount of light in the new bathroom. The existing dining room window was removed and the electrical below it was relocated. A new 3’0 door was framed for, anticipating wheelchair use in the future. Sandy Bay tile from Dura Ceramic was installed on the bathroom floor. An oak transition was installed at the door where the wall had been removed. Our customer’s choice of a Wellborn Forrest raised panel vanity in the color of Carmel topped with a cultured marble counter top in White Parchment makes for a crisp look. A roll-in barrier free shower unit with seat was selected and installed. The Mirabelle Right Height toilet is ADA Compliant. The Nutone exhaust fan/light combination operates quietly. Delta fixtures were selected and installed in both the shower and lavatory. Together these items created an attractive Universal Design bathroom addition. A new 3-0, 6-8 interior door was installed at the home’s existing foyer/living room entrance, providing privacy for the new occupant’s bedroom from the home’s main entrance. The plans for this bathroom addition had two goals. To encompass the universal design features in this bath addition as recommended for those aging at home. And to retain the integrity of the original home for continued use when the area is no longer used by the mother. Both goals were met. What a simple way to accommodate an aging parent! This is really something amazing, how we can remodel our bathroom for an aging person. Thanks for sharing the blog and some of the ideas how we can do that.